Earlier this year Microsoft discontinued security updates for Windows XP with Service Pack 2, and Windows Vista with no service packs. I'm still seeing a lot of machines out there without the latest service packs installed, most of which are now out of support. Users running Windows Vista without any service packs have not had any security updates for over four months now. That should set some alarm bells ringing. Those on Windows XP SP2 might have noticed this month's patch Tuesday being somewhat quiet. That's because you're not getting your updates! I generally recommend people to install service packs as they're released. However I do come across other IT support people recommending people to "wait". Of course in reality they end up waiting so long they forget to install it and reach end-of-life for their version, blissfully unaware that their machine is now vulnerable to dozens of exploits with more increasing every month. 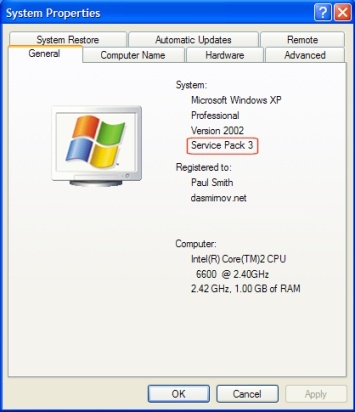 As of this post Windows XP's latest service pack is version 3, and Windows Vista's is version 2. Your service pack version will be indicated within the red box. If you have less than Service Pack 3, or no service pack is listed you should upgrade now. Your service pack version will be indicated in the red box. If there is nothing listed there, then you do not have any service pack installed. In that case you should upgrade now. 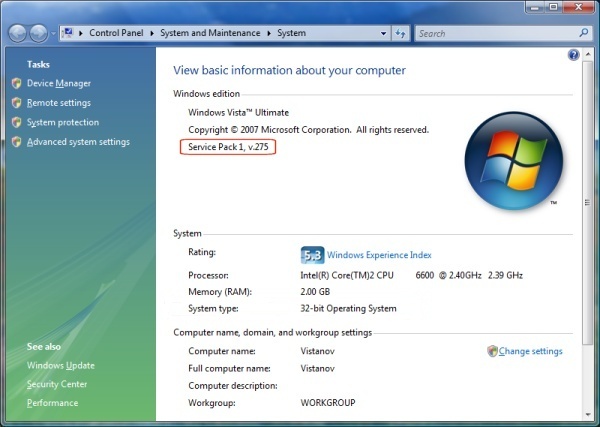 Service Pack 1 is still supported, however I'd still recommend upgrading. The fastest way to do this would be to check Windows Update. On Windows XP or Windows Vista you can click Start -> All Programs -> Windows Update. If for some reason Windows Update isn't listing any service packs, check to make sure the update hasn't been hidden, on Windows Vista you can do this by clicking 'Restore hidden updates'. If it still isn't showing up, then download the full installers manually. Here's Windows XP SP3 and Windows Vista SP2. So do yourself a favour and just check to make sure your machines are up to date. First up we see the percentage of browser exploits on Windows XP vs Windows Vista. We can see on Windows Vista only 5.7% of the exploits are targeting Microsoft code, while on Windows XP that figure is 42.3%. A break down of the security vulnerabilities on Windows XP looks like this, a mix of Microsoft and 3rd party vulnerabilities. On Windows Vista however none of the top 10 vulnerabilities being exploited effect Microsoft code. We see a make up of RealPlayer, Apple's QuickTime and several browser toolbars and plugins instead being responsible for the exploits. Lastly we see the infection numbers for Windows XP and Windows Vista. The most secure client version of Windows being Windows Vista SP1 x64, followed closely behind by the 32-bit client. What can we draw from this? If you want to keep your system secure 1) Use Windows Vista 2) Don't install any Apple software, RealPlayer, or any dodgy toolbars or plugins on your computer. Let's put this bit of FUD to rest. Fact: Windows Vista on launch was around 5-10% slower than Windows XP for gaming, this was largely due to video drivers not being as mature. 10% isn't even noticeable, I'd happily trade 10% for video drivers which don't take out the entire system when they crash thanks to them running in User Mode in Windows Vista instead of Kernel Mode like they do in Windows XP. Fact: That gap was closed months ago, and now in many benchmarks Windows Vista is faster. They also benchmarked World in Conflict, where the two were dead level. Conclusion: there's no difference, and if somebody wants to get picky and argue Windows XP must be faster, kindly point them in the direction of some benchmarks. I've recommended AVG Free anti-virus for years (update: I now recommend Security Essentials), I used to run it back when I was using Windows XP. I've still not, after using Windows Vista for two years, got around to actually installing any anti-virus on my main machines. But when my sister got her new laptop, as she had administrative rights I made sure to install some before handing it over. There are other free anti-virus software out there, such as Avast which like AVG Free is licensed just for personal usage. Avast however I found to be more annoying than AVG, and by annoying I mean with stupid things being thrown all over the screen and stupid animated icons in the tray. AVG Free up until version 8 was plagued by this annoying update window that popped up when there was an update to install. It was by far the most annoying feature of the program. AVG Free 8 however seems to of fixed this, to date while using the laptop I've yet to see AVG Free open a stupid window saying updating or any other annoying bubbles - once its been configured properly. No doubt as many of my readers know, I detest heavy security suites. Honestly they cause more problems than the security issues they're supposed to be protecting you against. On Windows Vista all I would recommend somebody install is AVG Free 8, they don't need some bloated security suite which half takes over the system. However getting it configured right so it doesn't ruin the user experience is important, and cannot be done using the default settings. I hope to make this the first of a few guides. Whenever I see somebody else's computer I am shocked at how much junk is on the system, and how ugly it looks, you only need to look at some of the screenshot threads on Portal Forums to see how bad some people's systems are - no wonder Mac marketshare has gone up 1% if people associate Windows with such a bad user experience - a bad user experience almost entirely created by 3rd party applications, often times installed by the computer manufacturer, but sometimes installed by security suites that people are frightened into buying. Part 0: Finding it on their website. Grisoft have no doubt made it harder to find the free version, and when you do find it you get prompted at several screens to try and full internet suite. I think it has moved off their main website, or is very buried, but you can find it on free.grisoft.com. If you do have problems finding it, a search engine will no doubt track down a copy of it. Just make sure to get it from somewhere trustworthy like CNET's download website. Part 1: Installation and first run. After clicking accept past the licence screens the first option we get in the installer asks us if we want to choose "Standard installation" or "Custom Installation". May I suggest we pick "Custom Installation". After that we get an activation screen, just hit next on that and then we're prompted to select which modules you want installed, typically I'd recommend un check everything other than the core program, e-mail scanners are known to cause issues with some e-mail clients. As are document scanners and other programs if they're ever offered I'd recommend avoiding them and relying on the core resident scanner instead. Next we get asked to install the "AVG Security Toolbar", no thanks, deselect the check box and select next. It'll then ask us where we want to install, the default location is fine. It'll then go ahead and complete the installation. Once the installer has finished it'll open up the first run wizard. Step 2 of 7 asks us how often we'd like to install updates, for me this appears to be greyed out, the other section however asks what time we'd like our daily scans to take place. I typically would disable automatic scans, but you can set this how you like. Step 3 of 7 asks if we want AVG to collect data about our usage habits, select yes if you want, or no if you don't. Step 5 of 7 and asks if we want to update now. Sure why not. It then prompts us to register, I'm fine thanks, clicking next and then finish will complete the first run wizard. At this point I would typically delete the icon it left on the desktop (without asking for my permission to do that). We're almost done, now we just have to tidy up a few loose ends. Double click on the AVG icon in the system tray, which should open the application control panel. From here, at the top of the window in the menu bar is the "Tools" option, clicking that and select advanced settings. I'd suggest turning off all the silly notifications, we don't need it throwing something up on the screen just because it updated itself. It places a little status icon next to every link, and whenever you bring the pointer near it throws open that little window saying about the website, and offering an advertisement to upgrade to a more bloated security program. No thanks. I want the browser to work how the people who designed the browser intended, I want to see the web page how the designer intended. I'm not a fan of 3rd parties throwing their code into the browser willy nilly, I recommend this option gets disabled. Internet Explorer 7 on Windows Vista is sandboxed and isn't vulnerable to drive-by downloads and the like, plus the phishing filter let's you know of any dodgy websites that may try and steal your details anyway, this seems unnecessary to me, and overly bloated. There's two ways to go about doing this. The first and most obvious way is to disable it from within AVG itself, at the main control panel, double click on "Link Scanner" and there's an option to turn it off. Simply deselect the option and OK your way out. This does have one problem, it turns the AVG tray icon into ugly mode, to notify you something is wrong. So I've tried disabling it via Internet Explorer's add-on management controls, and AVG doesn't seem to realise its disabled from in there, keeping it happy looking. You can disable it from Internet Explorer by clicking Tools and selecting Manage add-ons. Then you just need to find AVG Safe Search in the list, and click disable. Restart the browser and its back to normal. Step 3: Enjoy your computer, knowing it isn't overly bloated like it would be if you installed something like Norton or McAfee. Once that is completed, you've got AVG Free 8 installed how I would install it on one of my machines. Streamlined and out of the way, how all security programs should behave out-of-the-box. How do I know if my system is 32-bit or 64-bit? This question pops up quite a lot in online forums nowadays. Before I could quite honestly tell somebody if you need to ask, you have 32-bit. That's not true anymore, you can buy machines with 4GB of RAM in them, and increasingly they are being loaded with 64-bit Windows Vista, so the system can make use of all the memory. You can find out by going to Control Panel -> System and Maintenance (System and Security for Windows 7 users) -> System. Alternatively you can search for System on Start Search, the search will return a few results, but one should just be the word System, with a computer icon next to it with a white tick on a blue monitor. That's the one you're after. Clicking on that will launch the following. System type displays if the system is 32-bit (often referred to as x86) or 64-bit (also known as x64 or x86-64). If you're running Home Edition, you're using 32-bit. Professional shipped as 32-bit and 64-bit, but almost nobody uses x64. To check go to Start -> Right-click on My Computer -> Select Properties from the Menu, from there the 64-bit versions will be listed as Microsoft Windows XP Professional x64 Edition. Otherwise you're running 32-bit. So this error message has been doing the rounds lately. This application has failed to start because d3dx9_32.dll was not found. Or other error messages around d3dx9.dll, dxdx9d.dll, d3dx10.dll, xinput.dll, xact.dll, d3dx10_33.dll, d3dx9_40.dll and other variations being missing, not being found or installed. These are all optional components to DirectX that may not be installed with the version of DirectX you already have on your system. Typically these will be installed when the game installs DirectX, however for historical reasons a lot of gamers, knowing they had the latest version of DirectX didn't bother (I never do either). Microsoft a couple of years back provided these optional components in the SDK, and as such may not be installed with the version of DirectX present on your system. Age of Empires III (3). Ghost Recon Advanced Warfighter 2. I'm sure there's probably a couple of dozen more games, feel free to list any additions in the comments below. The solution is to either install the version of DirectX on the game's disc, or download the latest DirectX End-User Runtime from Microsoft (at the moment this is being redirected to the Games for Windows website), or from the Download Center.